For chimichurri sauce, mince the onion, red pepper, garlic, and parsley. Stir together with spices and then stir in olive oil and vinegar. 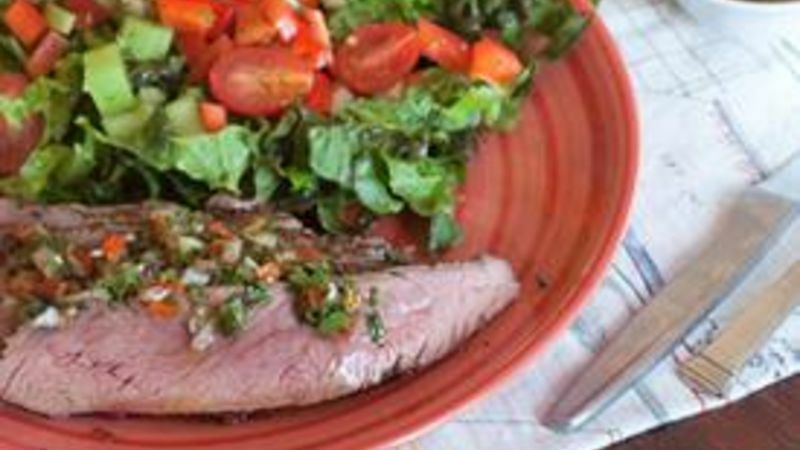 Let chimichurri sit for at least 30 minutes at room temperature so the flavors can develop. You can make it a day in advance too. For flank steak, rub both sides with olive oil and season well with kosher salt, black pepper, and red pepper flakes (optional). Wrap the flank steak in plastic wrap or cover it and let it sit in the fridge for a few hours. This is optional, but it does help the seasoning penetrate the meat. Take the flank steak out of the fridge 30 minutes before grilling so it can come to room temperature. Preheat grill to high heat. If you're using charcoal, let the coals burn down until there is no flame, but they are still super-hot. Add steak to grill and let it cook for around 7-8 minutes on the first side. Flip the steak and let it cook for another 6-7 minutes on the second side for a medium rare steak. This time will vary a bit depending on the thickness of your steak and the hotness of your grill. You can also use the poke test to get a rough idea of doneness. Refer to my chart in the blog post for this recipe to see what to feel for. When the steak has reached your desired level of doneness, remove it from the grill and let it rest for five minutes. Slice steak against the grain of the meat into 1/4 inch slices. Grilling a steak can be intimidating. It’s a big hunk of fairly expensive meat and getting it wrong can get you banned from any grill in a ten-mile radius. But getting it right means that friends and family will consider you a true grill master. After all, it’s pretty easy to cook a hamburger, but cooking a steak can be a tricky situation. If you are new to grilling, then my Grilled Flank Steak with Chimichurri will secure you a spot next to the grill for a long time to come. There are a ton of steak cuts that go well on the grill. From ribeyes and T-bones to New York strips, the world is your cutlet when you want to grill a steak. But these cuts can be really expensive and if you’re just starting out, you might want something a bit more forgiving on the grill and on the pocketbook. Enter flank steak. Even the best flanks steaks around will be around $8-$10/pound as opposed to $25-$30/pound for other steak cuts. The cut is generally seen as a leftover cut but it has gained popularity in the last few years because it has a lot of flavor and is really easy to prepare. Quite frankly, it’s my favorite steak to grill. The first rule when grilling steak is similar to the first rule of surgery: Do no harm. You bought a steak and you want it to taste like steak. Don’t put a lot of fancy rubs or marinades on it. At the most, I’ll rub my steak with my all-purpose dry rub, but most of the time I just use olive oil, kosher or sea salt, and fresh cracked black pepper. Rub the steak down well with oil and then give it a good seasoning with salt and pepper on both sides. I use about a tablespoon of both for a 2 ½ pound flank steak. If you have time, wrap the steak in plastic wrap and let it rest in your fridge for a few hours. That will give the steak some time to season nicely. Before you grill the steak, it’s really important to let the steak rest at room temperature for at least thirty minutes. You don’t want to throw a completely cold steak on the grill or it won’t cook evenly. There’s only one rule for how to grill this steak: HOT. If you’re using a gas grill, crank all your gauges up to high and let the grill pre-heat for at least 5 minutes so it is blazing hot. If you’re using charcoal, let the coals burn off for a bit, but be sure to throw the steak on before the coals start cooling off. Once you have your steak on the grill, you have to decide when to flip it and when to remove it from the heat. Flipping time is pretty easy. I like to go for around 8 minutes on my flank steak and then I’ll give it a flip. You want some nice char marks on the side. Knowing when to remove the steak is a bit trickier. While you could use a thermometer, the steak is fairly thin and it’s hard to get an accurate reading. Generally, 6-7 minutes on side two will give you a medium rare steak, but it depends on the thickness of your steak and how hot your grill is. Luckily, the only guide to doneness that you need is in the palm of your hand! By pinching your fingers together lightly and touching your palm right under your thumb, you can judge the doneness of the steak. Personally, I think flank steak is best medium rare. When you pull your steak off the grill, it’s very important to let it rest for about five minutes before cutting into it. That will let the juices redistribute in the meat and also let the steak finish cooking a bit. Then take a very sharp knife and slice it against the grain, which means against the natural fibers of the meat. This will make each slice really tender and easy to eat. I love to top my steak with a spicy chimichurri sauce. It’s easy to make and really accents the meat flavor. To make it, just dice all the veggies finely in a bowl. Then mix in the olive oil and vinegar. The mixture is best if you let it sit for an hour or two at room temperature. You can serve this steak with almost anything. It goes great with other grilled items like asparagus or potatoes. It’s perfect on a salad or you can even go the breakfast route and serve it with some over-easy eggs. The flank steak is the gateway steak of grilling and I hope you give it a shot! Nick ate this flank steak for days and couldn’t be happier about it. Be sure to check out his blog, Macheesmo, his book that has an entire chapter on flank steak, Cornerstone Cooking, and his Tablespoon profile.